This all in one formulation combats Puffy Eyes, while also provides rich hydration to restore a youthful look to the eye area. 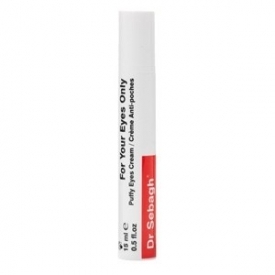 FOR YOUR EYES ONLY is an innovative and effective solution specially designed to help mobilise the fatty material that gives your eyes a puffy appearance. Contains powerful enzymes to shrink the capillaries that cause unsightly blue-ish shadows and Phosphatidyl Choline (P.C), a natural fat-soluble substance that mobilises the fatty material that gives your eyes a puffy appearance. - Diminishes unsightly dark circles. Aqua/Water/Eau, Stearyl Heptanoate, Glycerin, Phosphatidylcholine, Zea Mays (Corn) Oil, Aloe Barbadensis Leaf Juice, Cetearyl Octanoate, Butylene Glycol, Triethanolamine, Phenoxyethanol, Carbomer, Panthenol, Chlorphenesin, Pyridoxine Hcl, Caprylyl Glycol, Hesperidin Methyl Chalcone, Hydrolyzed Collagen, Dipotassium Glycyrrhizate, Steareth-20, Parfum (Fragrance), Xanthan Gum, Chlorhexidine Digluconate, Kigelia Africana Fruit Extract, Potassium Sorbate, Magnesium Nitrate, Polysorbate 20, Butylparaben, Ethylparaben, Isobutylparaben, Propylparaben, Methylparaben, Acetyl Tetrapeptide-5, Dipeptide-2, Palmitoyl Tetrapeptide-3, Methylchloroisothiazolinone, Magnesium Chloride, Methylisothiazolinone, Palmitoyl Pentapeptide-3, Limonene.